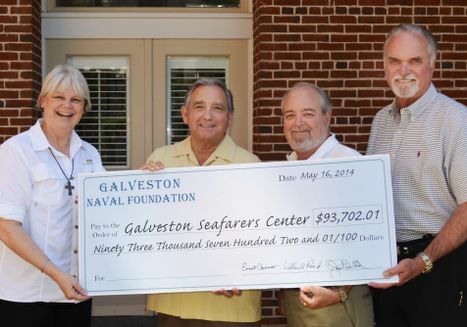 Galveston Naval Foundation, a non-profit organization dedicated to supporting seafaring military men and women, is donating more than $90,000 to the Seafarers Center of Galveston. The generous donation will help to offset the costs of several ongoing maintenance needs facing the Seafarers Center’s more than 140-year-old facility. The Seafarers Center of Galveston is housed in the John Koobbel Building, which has a rich maritime history that dates back to circa 1870. The Moody Foundation owns the facility and has provided use of the building to the United Ministry to the Port of Galveston as long as it is used as the Seafarers Center. The Seafarers Center offers a safe haven for seafarers far from home. The organization provides spiritual guidance and counseling both on and off ships. They also provide cell phone service for those unable to leave their ship as well as other comforts to help ease the distance for seafaring souls far from home. The Seafarers Center of Galveston was founded in 1973 as an ecumenical venture of the Episcopal, Greek Orthodox, Lutheran, Methodist, Presbyterian, and Roman Catholic Churches. Supported also by the Men’s Propeller Club, The West Gulf Maritime Association, Galveston Maritime Club and other generous donors, the Seafarers Center’s mission is to provide seafarers of the world a safe place to rest, relax and enjoy the freedom of religious expression; to regain contact with family and friends; and to provide counseling and comfort in times of need. Galveston Naval Foundation (GNF) is a non-profit, 501(c)(3) organization dedicated to supporting the men and women in uniform who stop in at Galveston Island, Texas. Their mission is to offset the cost of Naval and Coast Guard events that would normally impact the Morale and Welfare Fund of a visiting ship. GNF has supported such events as the commissioning of the USS Fort Worth, USS Ross and USS Texas, among others at Pier 21®. Their contributions have helped cover the costs of ship commissioning for the service men and women who stop in the Port of Galveston. From left to right, Karen Parsons, full time chaplain for the Seafarers Center, receives check from the Galveston Naval Foundation board members Ernie Connor, Jay Donnella, and Bill Ross.